This visit to Pearl Harbor never gets old. I encourage you all to buy tickets for the boat ride to the USS Arizona memorial BEFORE getting to Pearl Harbor. Don't be disappointed if your ride to the memorial gets cancelled due to high winds. Schedule your visit to the Memorial as early as possible even if it is 7-8 am! It was very informative, well done, and good to see the historical events of our country's military be displayed in such a wonderful way. The kids loved it and so did we! 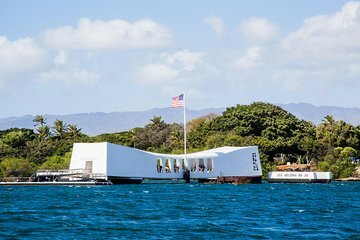 Since this is one of the most visited attraction in Honululu is always good to the have your ticket reserved and plus Viator has the same price as the ticketing booth in Pearl Harbor. Very good information presented in easy fashion to follow! Complete waste of money. When we presented our voucher at the Memorial Site they did not recognise it AND we had to pay an additional 15 for the audio tour which was supposed to be included !! We really enjoyed this narrated tour. An important detail that I missed seeing is that this tour does NOT include tickets to go out to tour the Arizona. We were lucky enough to receive 4 free tickets at around 10am that were good for the 3pm tour that day. By 11am all of the free tickets cannot buy them had already been handed out. Reserve tickets online far in advance if you can and use the Hawaii forest service site. The tours are all booked by time so there are no long lines as you will be assigned a specific time. It was the most awesome vacation! Loved the USS Arizona Memorial, it was so surreal. God Bless our men and women in our arm forces.